The logo is that of the Critical & Creative Thinking graduate program where I work, helping mid-career or career-changing students to “develop reflective practice as we change our schools, workplaces, and lives.” Posts on this new blog are in the same spirit. Posts specific to complexity in environment and biomedicine continue to be made on this Intersecting Processes blog (from which the first four months of the new blog have been extracted). I am imagining that most readers with science and complexity interests will prefer to peruse blogs in that area when they visit this blog and ditto for readers with reflective practice interests when they visit the new blog. Cross-posting will lead readers from one area of interest to the other, if they are inclined. Q: What constitutes a kindred thinker for the new blog? A: Someone who wants to promote critical thinking and reflective practice through teaching, groups processes, institutional change in the academy, and more broadly. This entry was posted in reflective practice and tagged blogs, critical_thinking, reflective_practice on January 1, 2011 by Peter J. Taylor. Why a blog? Why this blog? Q: What constitutes a kindred thinker? A: Someone who is interested in addressing complex situations “that cut across scales, involve heterogeneous components, and develop over time” and extending this interest to the interpretation of the researcher-in-social-context and to engagements that modify the directions that researchers take (including their own). 4. To complement, not substitute for, the personal connections through workshops [e.g., NewSSC] or regular conversations [e.g., ISHS]. Q: What combination of kinds of internet-facilitated connectedness is generative, sustaining, sustainable? A: I have been exploring this question with colleagues who make effective use of social media, e.g., making friends after twittering during conferences or having their blogs viewed after commenting on other people’s blogs. The best result seems to be nested kinds of connectedness, with some people linked in immediately responsive and helpful ways and others just aware of one’s existence. This is a topic for more exploration, reflection, and discussion. This entry was posted in reflective practice and tagged blogs, reflective_practice, social_media on November 19, 2010 by Peter J. Taylor. Collaboratively contribute to each participant generating a practical vision for future developments based on evaluations or on statements, questions, and/or reservations concerning a certain challenge, such as learning from what has happened before (e.g., in a course, at a conference, etc.). This approach is based on Strategic Personal Planning as developed by the Institute for Cultural Affairs in Canada. 1. Either a. assemble written evaluations from, say, a conference, or b. ask a defined group (e.g., students in a course) to compose five statements, questions, and/or reservations that are important to them concerning a defined challenge (e.g., supporting each other to complete the course project by the end of the semester). 2. Circulate the sheets. Digest them one by one and make notes on what you read with a view to representing not only your own views but also those of others (who may or may not be present at the session). Imagine yourself some time in the FUTURE looking back with a sense of accomplishment on how far the group (e.g., conference organizing group, the students in the course) have come in response to the challenge (e.g., the issues raised the evaluation) = the IDEAL. Construe accomplishment broadly so it can include your own reflection and growth. RETROSPECTIVE: What happened to make this so?–What different kinds of things do you envisage having gone into or contributed to the positive developments? 3a. Discussion in pairs of each other’s post-its while waiting for others to finish. 4. Photocopy assembled post-its (so each participant has a copy). Move the post-its around into groups of items that have something in common in the way they address the challenge. Group the groups in pairs or threes and give these larger groups descriptive active names. Group these groups and name them, until you arrive at a descriptive active name for the practical vision post-its as a whole. Experience post-it clustering as a fruitful way to clarify your future and thus go on to complete the activity after the session is over. This entry was posted in reflective practice and tagged cardstorming, heterogeneity, reflective_practice, workshop on November 5, 2010 by Peter J. Taylor. When the interdisciplinary graduate program I teach in (CCT) was moved under a Department of Curriculum and Instruction, I decided to learn more about the theory that guided the Curriculum studies field. I came across William Doll’s account of postmodern curriculum design, which centers on another “4R’s”, in this case: richness, recursion, relation, and rigor (Doll 1993). My immediate response was that his R’s do not capture a lot of what goes into CCT students’ mid-career personal and professional development. I soon had twelve R’s, and then more. 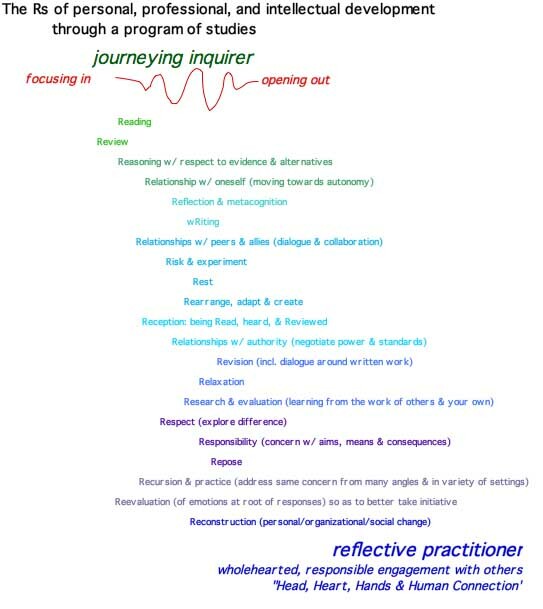 The figure below took shape as I played with ways to convey that some R’s will make limited sense until more basic Rs have been internalised and that periods of opening out alternate with periods of consolidating experiences to date. I sometimes present this schema to students as a way to take stock of their own development. I suggest that, at the end of each semester for as many Rs as they are ready to, they give an example and articulate their current sense of the R’s meaning(s). However, I mostly use the many R’s to remind myself as a teacher to expect the flow of development to be windy and less than direct (see note below on the contrast with “backward design”). Counterpoint to backward design. The schema of many R’s also stands as a counterpoint to the popular idea of backward design in curriculum, that is: identify desired results, determine acceptable evidence of students achieving those results, plan learning experiences and instruction accordingly, making explicit the sought-after results and evidence (Wiggins and McTighe 2005). Wiggins, G. P. and J. McTighe (2005). Understanding by Design. Alexandria, VA, Association for Supervision and Curriculum Development. This entry was posted in reflective practice and tagged reflective_practice on October 20, 2010 by Peter J. Taylor.